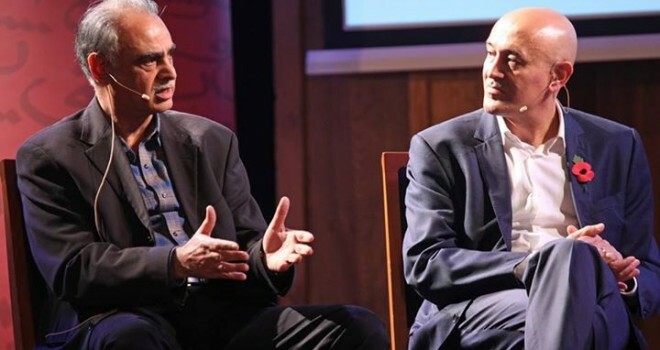 Two important figures came head-to-head at Conway Hall, to discuss Islamic versus Humanist perspectives on science and the modern world. Jim Al-Khalili made the final public appearance of his term as president of the British Humanist Association during this stimulating, and at times provoking, debate with Ziauddin Sardar, chair of the Muslim Institute. Al-Khalili advocated the values of the European Enlightenment, arguing that ever since the “Age of Reason” took hold during the 18th century, Humanists have looked to science instead of religion to explore and comprehend the world. Sardar upheld the view that it is the combination of faith and reason that offers a fuller understanding of the world, maintaining that it was this worldview that enabled the development of science in the Islamic golden Age. A practising Muslim, Sardar is on an independent mission to promote rational, considered thought in interpreting the Qur’an. He explained that when he came to the UK from Pakistan, he found comfort in the familiar language of mathematics, which set him on a trajectory to train as a physicist: “God doesn’t need me, I need him. It makes me a better person and a better scientist”, he said. He described the way in which, as a child, his dissatisfaction with rudimentary religious guidance at home instilled a strong urge for self-enquiry: “Science forces you to ask questions. The more you think, the [fewer] answers you find”. Sardar asserted that religion and reason are two sides of the same coin and feels that conflict between the two is deliberately manufactured. He argued that problems arisewhen Muslims adopt a narrow, reductionist interpretation regarding the holistic concept of ilm – whereas in fact there are many facets to knowledge. In short, Sardar’s view is that although human knowledge at times converges with the Qur’an, the text should certainly not be treated as a scientific encyclopaedia. In support of this view, Sardar lamented the emergence of the I’jaz movement, which insists the Qur’an contains descriptions of modern scientific phenomena ranging from quantum mechanics to accurate descriptions of the stages of embryology and geology. In Sardar’s opinion, this stems from insecurity and a personal need to vindicate Islam to others. Jim Al-Khalili agreed that ascribing literal meanings to religious texts can be perilous and that these verses should be interpreted more metaphorically. Likewise, when Einstein famously said “God does not play dice” he was using a figure of speech to acknowledge that there are things we don’t yet understand but this shouldn’t stop us from trying to find out more. Al-Khalili is a prolific advocate of the Islamic golden age of science: he has authored a book on the topic and has just finished presenting a new TV series about it on Al-Jazeera. Although Al-Khalili questioned if some of the major scholars were culturally religious rather than devout followers, he acknowledges the clear interconnection between faith and science during the medieval period. In support of this his cited Simon Schaffer’s thesis on the subject: once a belief in a single God was established there was an impetus to understand the nature of his creation and discover how things work using the brains He equipped us with. For instance, as the Islamic empire expanded to other lands, Muslims in these new territories were required to know the direction of Mecca for prayer, which led to leaps in map-making and trigonometry, along with a better understanding of geography. The need to establish the schedule for daily prayers, and to forecast the precise timings of sunset and sunrise for fasting during Ramadan, spurred major advances in astronomy by perfecting instruments such as the astrolabe. The importance of cleanliness, coupled with the urge to heal the sick, were incentives for major advances in medicine. “So why we have forgotten the vast contributions of Islamic scientists and thinkers?”, Al-Khalili pondered. Whilst we champion the work of Galileo, Kepler and Newton we still need reminding about earlier influencers such as Al-Biruni, Al-Tusi and Ibn Al-Shatir who had an impact on the work of Copernicus. Similarly, Ibn al-Haytham articulated the scientific method long before Descartes, Al-Khalili emphasised. Whilst Al-Khalili confessed that science could be regarded as a form of ideology, he argues science is substantiated through the mechanisms of experimentation and reproducibility rather than relying on “blind faith”. Whilst individual scientists may carry personal bias, dogma or have vested interests, the process of science itself is self-correcting. He admitted this isn’t always the case when it comes to daily practice. For example, string theory is still a mathematical game rather than a bona fide theory as we don’t yet have a testable way to verify it. In his opinion, we should keep searching for answers – it is intellectually lazy to not investigate further. And what if science proves religious dogma to be incorrect? The heliocentric theory and understanding of evolution have already made previous concepts about the world redundant. “If science conclusively proves something to be true then the preceding religious dogma would have to change”, Sardar conceded .“But the point is, science doesn’t necessarily come up with final answers. Much like religion, science is open to constant revision and reinterpretation”, he argued. Sardar is alarmed by non-rational Islamists advocating worldviews that go against the grain of science. “I find the dawn of creationism in the Muslim world astonishing: historically Muslims were never creationists,” he lamented, referring to the work of Al-Jahiz and Ibn Tufail who wrote extensively on spontaneous generation and pre-Darwinian concepts. Sardar presented the notion that the early Muslim community had enough self-conviction to co-exist successfully in a plural society, but that over time this self-confidence became eroded as a more rigid form of Islam took hold. “Dogmatic people dislike uncertainty” observed Sardar, who further suggested that the outlawing of ijtihad (critical reasoning) spelt the end of Islam’s Golden Age. Al-Ghazali was portrayed as the main party-pooper: he launched a devastating attack on Aristotelian rationalism following a personal crisis of faith. Ironically, this came after being upheld as the beacon of philosophical thought in his earlier years. Caliphs who were initially great patrons of scholarship gradually became increasingly conservative and closed their gates to free thinkers. Historians currently conclude the Islamic golden age of science began to decline during the 12th Century but this stance ignores the major contributions made during the Ottoman Empire up until the 14th Century. In Sardar’s opinion, Ibn Khaldun was the last great scholar of the age; he died in 1406 CE. But what is the state of contemporary science in the Islamic world today? Al-Khalili acknowledged we need to be concerned about the rise of anti-scientism in certain parts of the world. Whilst some are suspicious of science as a form of authority, there is also a universal race to be world-class leaders in science and innovation. However, Sardar believes such initiatives in the Arabian Peninsula rely on imported labour and imitate research already happening in the west. On highlighting developments in the Gulf in particular, Sardar warned that having “money and no brains” is a dangerous combination: it’s easy to order new buildings and research labs, but unless these are accompanied by a sustained spirit of rational enquiry this kind of movement is vulnerable to crumble. Sardar sees himself as part of a vehicle trying to recreate rational discourse in Islam. Through hosting fellowship programmes and publishing the Critical Muslim journal via the Muslim Institute he founded, Sardar is endeavouring to cultivate a critical mass of freethinkers who can influence positive change. While this may be feasible in Britain, it’s much harder for those living in Muslim nations today to ask intelligent questions without major repercussions. Al-Khalili hopes to see debates on evolution happening in the Middle East, which would signal a genuine rekindling of rational thought. A previous debate on evolution in the UK did generate some groundbreaking discussion, but this initiative has not been sustained on the same scale. Rather than indulging in adversarial polemics, the event succeeded in facilitating lively yet complex dialogue to a riveted audience of 400 Humanists and Muslims. During the three years of Al-Khalili’s presidency of the BHA, he has proved himself to be an effective agent of intercultural dialogue. I hope the next president will continue on this track. By Yasmin Khan, published in The Guardian, November 6th 2015.